We learn two things from these incidents: 1) Notre Dame is not really committed to its coaches, and 2) Notre Dame’s coaches are not really committed to Notre Dame. Gone are the glory days, when coaches came to Notre Dame primarily because they wanted to come to Notre Dame, and when athletes and athletic staff were really nurtured and cared for as important members of the “Notre Dame community.” Now it appears that coaches only want money and honor, and Notre Dame only wants to win. 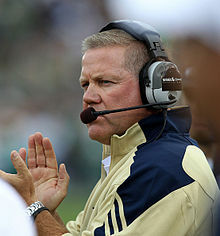 Coaches can sacrifice Notre Dame for career advancement, and Notre Dame can sacrifice coaches for program advancement. Kelly’s recent job interview may be appalling, especially since it took place after his players lost a grueling game, the most important game in many of their lives. It should not, however, surprise us. One Sports Illustrated article has illustrated with great clarity how our football program has lost much of its identity over the last few years. Now, as our coach illustrates how his actions may be at odds with the University’s mission and values, we see ourselves losing again. Consider this: Some have suggested that, through this interview “Kelly may be angling for a pay increase.” If this is true, Notre Dame might as well fire the man for acting contrary to its values. Hundreds of Notre Dame students volunteer with the poorest of the poor every year. For a man who already has a multimillion dollar contract, leveling for more money can only come from one of the seven deadly sins, greed. Only great greed could incite a man in his position to even request more money. We would only further lose ourselves by giving in to such a vice.